For the investor who believes the share price is stagnating, the short straddle may be an appropriate way of earning income. The strategy consists of writing a call option and a put option with the same strike price. The short straddle is a high risk strategy, with the potential for damaging losses if the share price moves sharply in either direction. The maximum profit that can be earned from the short straddle is the premium earned from the sale of the options. 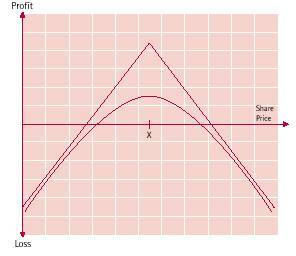 Maximum profit will result if the share price is at the strike price at expiry. If the share price moves strongly in either direction, the net premium received for selling the straddle provides limited protection, beyond which unlimited losses can occur. The stronger the move, the greater this loss will be. Time decay: the sold straddle consists of two short positions. As a result, time decay assists the combination. In order to get the greatest benefit from time decay, it may be best to trade options with near-month expiries, where time decay is starting to accelerate. Risk of exercise: unless the share price is exactly at the strike price of the two options sold, one of the legs will be in-the-money. Therefore, there is always a risk of early exercise on one leg or the other. market may be about to move strongly. The option trader must monitor volatility closely and be prepared to take action should it increase unexpectedly. 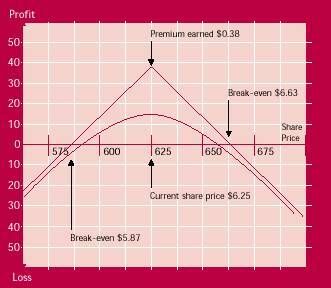 If the share price remains stable around the strike price, the maximum profit will occur. However, because of the risk of exercise, few short straddles are held until expiry. In the event of an adverse market movement, the investor may decide to close out one or both legs of the straddle. Alternatively, as mentioned above, an out-of-the-money option could be taken as protection. The costs of adjusting the existing straddle position should be weighed against the risks of leaving it in place. The short straddle is a high risk strategy and should only be employed if you are very confident that the share price will remain steady. Do not choose expiry months that are too distant. Be prepared to adjust your position if the share price moves strongly in either direction, or volatility increases. XYZ is an Australian bank. It has recently released profit figures which were in line with market expectations. Interest rates have been steady for several months and you believe they will remain stable for the next six months. You believe that during this period, XYZ's share price will not move significantly from current levels of around $6.25. In order to gain some income you decide to write a straddle. The information contained in this webpage is for educational purposes only and does not constitute financial product advice. ASX does not represent or warrant that the information is complete or accurate. You should consider obtaining independent advice before making any financial decisions. To the extent permitted by law, no responsibility for any loss arising in any way (including by way of negligence) from anyone acting or refraining from acting as a result of this material is accepted by ASX.